One might be inclined to dismiss hiking on trails amidst the throngs of vacationers who clog up a park's roads to catch a 30 second glimpse of some site on guidebook only to proceed to the next item of interest. The Valley Floor Loop in Yosemite Valley certainly lacks the solitude that many seek while hiking. But there remains ample reasoning to spend some time on the trails that amble over a large portion of one of the most famous valleys in the world. There are numerous trailheads for the loop since there are numerous parking spots along the valley's main roads due to all of the visitors parking here and there to stretch their legs and gaze at the wonders of the park. The Bridalveil Falls Trail trailhead has an added benefit of public restrooms for use before or after your hike. Being on the valley floor, the terrain is not terribly challenging and is downright flat in some areas. A few spots do provide its challenges though. For example, the myriad of streams that fan out from Bridalveil Falls present an obstacle that might be tough to manage when water flows are at their height. The Merced River is the main stream running through the valley. The trail takes turns meandering towards it and then back to the park's main roads. In those respites away from the cars it's easy to forget about the crowds. There are also some fine views of El Capitan and the river during these moments. 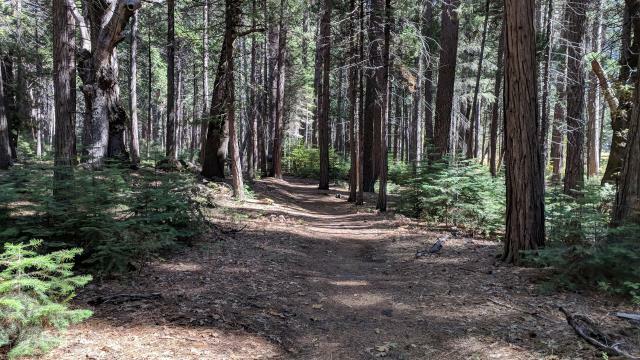 The trail is mostly easy to follow and passes through some meadows and forested sections. The northwest quarter of the trail is largely hemmed in by tree cover. This obscures some views of the valley walls. Another downside of this segment is the potential for gnats, which seemed more numerous here, at certain times of the year. 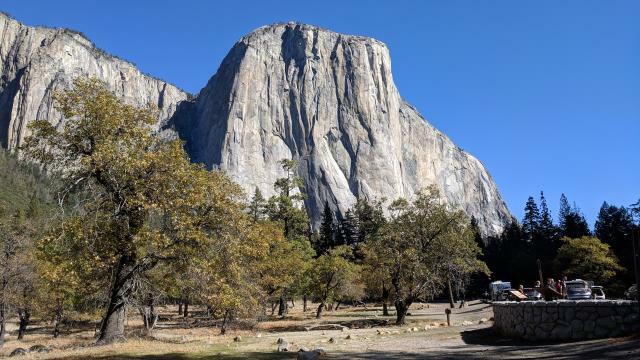 The trail passes near the base of El Capitan and so provides a great opportunity to observe the numerous mountain climbers ascending the wall "up close". A good pair of binoculars comes in handy to watch those who've made good progress working their way up the world famous 3,000 foot face. The southern trail section just east of Bridalveil Falls appears to twist through an old rock slide. The path undulates a bit in elevation as it also curves around large boulders that dot the landscape. There's the opportunity to see mountain climbers here as well and in some cases closer than on El Capitan. Coppertone and I decided on a flat hike to day to wrap up our week. A guided hike out of Yosemite Village opened our eyes to some of the sights one could see from a less glamorous trail such as this one. We started off with a short hike to see Bridalveil Falls since we started at the trailhead there. Then it was off to complete a reported 4.6 mile loop in the western section of Yosemite Valley. 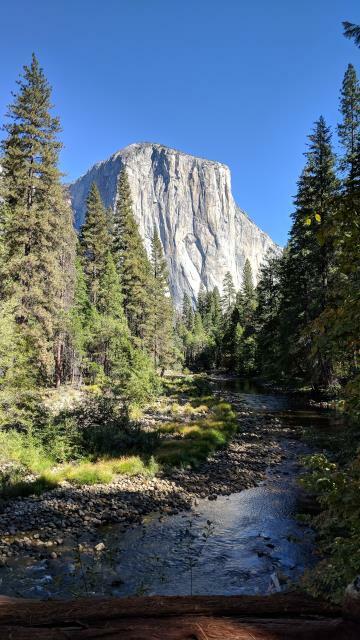 Things started off great as got several great views of El Capitan. The trail paralleled the busy road for a bit before retreating closer to the river, giving the hike a bit more solitude. The path would undulate towards and away from the road multiple times during the day. The water coming off of Bridalveil Falls fork into several streams, each of which needed to be crossed without the aid of a bridge. For our fall visit this was not too much trouble but we can imagine things may be a bit trickier in the spring when flows are more robust. Passing along the path of the Merced River afforded us yet more views of El Capitan and the hike was starting to look really good. The turning point, figuratively and literally came at the Pohono Bridge. Once the trail turned back to the east there were fewer vistas (at least for now) and much more persistent gnats (or whatever bug was in the air). Things improved a bit when we made to back far enough east to be near the base of El Capitan. The gnats started to thin and we enjoyed stopping for a moment here and there to watch the mountain climbers scaling the sheer walls. We didn't do the entire loop and cut the route off at Devil's Elbow and crossing the river on the El Capitan Bridge. We should have continued through the Cathedral Picnic Area to rejoin the loop on the southern side of the valley, but our guidebook gave some other instruction that involved following the road some more and using what must have been a maverick trail to get back onto the loop. Turning west again we started back on the loop heading to Bridalveil Falls. Though not as famous, the cliffs on this end of the valley are also in high demand by climbers and we go closer looks at the teams as they worked their way up vertical routes. The hiking here is perhaps the best in our hike as the trail undulates through rocky terrain though the trail itself is not that difficult. After about 8 miles we finally get back to the Bridalveil Falls area. This turned out to be a lot more than the 4.6 advertised in two guidebooks. Yes, our GPS could have been having a bad day accuracy-wise, but we encountered two ladies on the trail going in the opposite direction we were so we stopped and talked during the second intercept. They too seemed to think the trail longer than advertised. Well, at least it wasn't overly hilly at the same time!